Top of the mornin’ to ye! 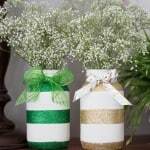 Hey, it’s Debbie here from Made From Pinterest and I’m super excited to be here today and share with you these glitzy and glammy St. Patrick’s Day Mason Jars. I love me some bling. If you asked my husband he would tell you that if I could sprinkle some glitter on my morning cereal, I would! So, it’s no wonder when I found that I got to come over and play here at Pam’s site for St. Patrick’s Day, I knew immediately what I wanted to make. These are super easy to make and the glitter really adds some sparkle to your holiday decor. Thoroughly wash and dry your Mason Jars. With a paint brush, paint your jars with an off white chalk paint. I painted mine with three light coats. After the paint has dried fully, apply strips of the painters tape onto your painted mason jar. My tape was rather wide so I cut it down to about 1 1/2 inches wide. Press the edges of the tape firmly onto the jar so that the glue and glitter doesn’t seep when you apply them. With a foam brush, apply a coat of Elmer’s Glue onto the exposed white paint of your jar and then sprinkle the glitter on. Make sure that if you are doing two jars, that each jar is on a separate piece of paper so that the glitter doesn’t mix. You will want to pour the excess glitter back into your jar. Thanks so much for letting us come and spend some time with you today! We’d love it if you hopped on over to Made From Pinterest and said hi sometime! If you have a minute, come check out these three recipes of ours. They’ve been pinned almost One Million times!